A conte of Saigo Takamori by Edoardo Chiossone. However, Chiossone hadn't ever met Saigo. 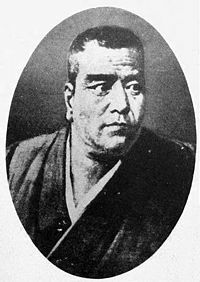 Saigō Takamori (西郷 隆盛, January 23, 1827 – September 24, 1877), original name Kichibe or Kichinosuke; literary name Nanshu, was one of the most influential samurai in Japanese history. He lived during the late Edo Period and early Meiji Era, and became a leader of the Meiji restoration. In 1867, Saigo’s troops supported the Emperor in the Meiji Restoration; with Katsu Kaishu, who was the representative of the Shogunate government, he achieved the bloodless surrender of Edo Castle and successfully conducted the coup d’etat of “Osei Fukko” ("restoration of Imperial rule"). He was later put in command of over 50,000 samurai, a large segment of the Imperial army. As a “Sangi” (councilor) in the new government, he helped to pushed through reforms. His participation in the restoration made him a legendary hero, but the same reforms dissolved the samurai system and caused him to lose his status. In 1873, he resigned his government post after losing in the Seikanron (debate over conquering Korea). In 1877, with the encouragement of the students of his private school in Kyushu, Saigo organized the Satsuma Rebellion against the government he had helped to restore. He was defeated by the government army and committed suicide. He later became a symbol of devotion to principle. Saigo was born on December 7, 1827, in Kagoshima prefecture. During his childhood, he was commonly known as Kichinosuke, with Nanshu as a pseudonym. His family was of the samurai class, with the lower rank of retainer of a daimyo (feudal lord). From boyhood, Saigo was distinguished by his unusual size and physique; as an adult he was almost six feet tall and weighed some 200 pounds. A giant among his contemporaries, with large, piercing eyes and bushy eyebrows, he appeared frightening at first glance, but was friendly and unassuming in manner. During a childhood scuffle with friends he injured his right elbow and was never able to bend it again, and it is said that this accident caused him to abandon martial arts and concentrate on his studies. This education was useful to him in his later life. In 1843, when he was sixteen years old, the domain of Satsuma appointed Saigo as an aide of Korikata, an agricultural administration. The job required considerable physical stamina, as it sometimes involved collecting tributes from local farmers. The magistrate of Korikata, Sakota Tajiuemon-toshinari, was famous for his righteous character. Sakota observed the suffering of the farmers because of heavy taxes, and resigned, posting a poetic warning to the upper bureaucracy on the gates of his office. The poem cautioned that if the office imposed unreasonably heavy taxes on the farmers, it would also, finally, collapse. Saigo learned from Sakota both about the agricultural administration, and about his beliefs and his righteousness. Shimazu Narioki, the 27th lord of the Satsuma domain, had a plan to choose Hisamitsu (the son of Narioki’s concubine, Yura) as his heir, instead of Nariakira, the son of Narioki’s legal wife. Although Nariakira was an enterprising and clever person, his father, Narioki, disliked him and did not wish him to be his successor as lord. At that time, Shimazu Narioki was already fifty-eight years old, and his son Nariakira was forty. Some groups in the Satsuma domain were dissatisfied with the lord’s unusual behavior. Two samurai leaders, Takasaki and Kondo, who supported Nariakira, began to act aggressively to delay “the lord Shimazu Nariaki’s retirement in supporting Nariakira to be the new lord.” When the lord Shimazu Nariaki learned of this movement, he was angry and punished them severely. Takasaki and Kondo were ordered to commit hara-kiri and others were exiled to remote islands. Saigo’s father had been related to Akayama Yukie, who also was ordered to commit hara-kiri. Saigo heard many stories about Akayama Yukie’s death from his father. The power of Nariakira’s group declined, but Nariakira himself never abandoned his determination to become the new lord. 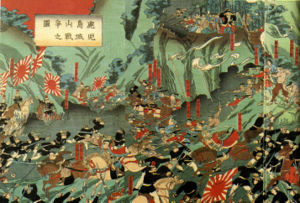 Saigo Takamori (upper right) directing his troops at the Battle of Shiroyama. In 1851, Nariakira became the 28th lord of Satsuma domain. He immediately began to modernize his domain, setting up the fabrication of steamships, researching the construction of a railway, and establishing an iron industry. Saigo submitted a petition concerning an agricultural administration to the lord Nariakira, who recognized Saigo’s ability and appointed him Edo-zume (one of the staff to the ambassador to the capital Edo). In Edo (modern Tokyo), Saigo had the opportunity to work with well-known leaders from other domains. In 1853, Commodore Perry arrived with four black-hulled steam frigates at Uraga, near Edo, with a letter from United States President Fillmore demanding the opening of Japanese ports. Perry returned with twice as many ships in February, 1854. A treaty had been prepared embodying virtually all the demands in Fillmore's letter. Perry signed the Convention of Kanagawa on March 31, 1854 and departed, mistakenly believing the agreement had been made with imperial representatives. In 1855, the Treaty of Shimoda, signed by Russian Vice-Admiral Euphimy Euphimy Vasil'evich Putiatin and Toshiakira Kawaji marked the beginning of official relations between Russia and Japan. At that time, the foreign policy of Japan was unclear and evasive. The 13th Shogun Tokugawa Iesada was weak in both spirit and body, and had difficulty overcoming these national crises. The lord Shimazu Nariakira urged the necessity of strengthening the national defense in response to the “weak-spirited diplomacy" of the shogunate. He plotted to install Hitotsubashi Yoshinobu (later Tokugawa Yoshinobu) as the new Shogun, and began to recruit several leaders to join him. Saigo, a favored supporter of the lord Shimazu Nariakira, worked hard to advance his policies in the Imperial court. Another group, organized by Mizuno Tadanaka, supported Tokugawa Yoshitomi (then a teenager) as a candidate to become the new Shogun. Mizuno Tadanaka used the subtle strategy of having Ii Naosuke, the lord of Hikone domain, appointed as the great elder (the highest-ranked adviser to a Shogun). In 1858, Nizuno Tadanaka succeeded Ii Naosuke as great elder and then made an informal decision to install Tokugawa Yoshitomi as the new Shogun. To counter the forcible and tyrannical policy of Ii Naosuke, lord Shimazu Nariakira decided to approach the Imperial court, and use the authority of Imperial power to pressure the shogunate, dominated by Ii Naosuke, to reform. Saigo was ordered by lord Shimazu Nariakira to negotiate with the Imperial court, and went to the ancient capital of Kyoto. However, on July 16, lord Shimazu Nariakira suddenly died. He had been mentor, benefactor, and almost like a god to Saigo. Saigo decided to return to his home town of Kagoshima and commit hara-kiri in front of the lord Shimazu Nariakira’s tomb, but a monk named Gesho, the chief priest of Kiyomizu-dera (Temple) in Kyoto, remonstrated with him. 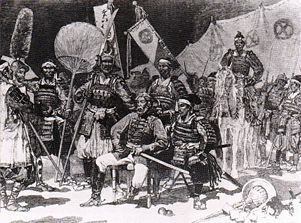 Saigo Takamori (seated, in Western uniform), surrounded by his officers, in samurai attire. News article in Le Monde Illustré, 1877. In 1858 and 1859, the great elder Ii Naosuke, increasingly despotic, conducted the Ansei Purge (Ansei no taigoku) to quiet opposition to his handling of the shogunal succession and the signing of the U.S.-Japan Treaty of Amity and Commerce. Over one hundred members of the bakufu, various han, and the Japanese Imperial court were "purged;" eight of them were executed. In the domain of Kagoshima, lord Shimazu Nariakira’s successor was Hisamitsu’son Tadayoshi. Since he was only nineteen years old, the former lord, the elderly Shimazu Narioki (Nariakira’s father) took over and changed all of Nariakira’s modernization policies. There were no more modern factories, and the local government despised Saigo, who had come back to Satsuma. Saigo asked the domain of Satsuma to protect the monk Gesho, who was regarded as a dangerous person by Ii Naosuke because he was a supporter of Hitotsubashi Yoshinobu (later Tokugawa Yoshinobu). The Satsuma domain refused, and, in despair, Saigo and the monk Gesho threw themselves into the freezing ocean waters. Miraculously, Saigo survived. Saigo was now thirty years old. The Satsuma domain sent him to Amami Oshima Island (one of the Ryūkyū Islands) to protect him from the purge of Ii Naosuke. Saigo remained in hiding there for three years, and married Aikana, the daughter of a distinguished family. In 1860, Ii Naosuke was assassinated outside of Edo castle by a samurai group from the Mito domain. After this incident, the shogunate government repented of Ii Naosuke’s policy as regrettable, and changed to ”Kobu gatai” (the movement of unity of Imperial Court and the shogunate). In Satsuma, lord Tadayoshi decided to offer his position to his father, Hisamitsu. Hisamitsu’s strongest supporter, Okubo Ichizo (later Okubo Toshimichi, one of the three great nobles who led the Meiji Restoration, now regarded as one of the main founders of modern Japan. ), demanded that Saigo be recalled from the Amami Oshima. Saigo returned to Kagoshima in 1862. By the age of forty, Saigo was commander of the Satsuma forces stationed in Kyoto and had made many contacts among those who were loyal to the Imperial court. He was an experienced diplomat, having organized the surrender of the domain of Choshu to the shogunate in 1864-65, and helped negotiate the secret alliance between in Satsuma and Choshu in 1866. He also helped to force the resignation of the shogun in November 1867. The Imperial loyalists were not satisfied with the political stalemate which followed the shogun’s resignation, and early in the morning on January 3, 1868, Saigo’s troops took control of the palace gates. A group of nobles was gathered, and the young emperor read them a proclamation which began the Meiji Restoration. There was a brief war between the shogunate and the new Imperial army, consisting mostly of troops from Satsuma and Choshu. In May 1868, Saigo negotiated the surrender of Edo (now Tokyo), then the shogunate’s administrative center, and in November defeated the shogun’s supporters in the north of Japan. Having ensured the supremacy of the Imperial court, Saigo retired to Satsuma and refused to participate in the new government, though he was awarded the highest honors by the emperor for his services. In 1871, he was placed at the head of the new Imperial Guard, consisting of 10,000 troops, and the leaders of the restoration began demolishing the traditional domains (han) and re-forming them into prefectures. Saigo was appointed to the Council of State (Dajokan) and given joint responsibility with Kido Takayoshi for carrying out this program. By the end of 1871, the han troops had all been disbanded and any possible military opposition had been removed. After studying the organization of European armies, some members of the government began to call for universal military service. Traditionally, the samurai class had monopolized warfare, and a conflict arose with those who did not want to deprive the samurai class of this distinction. Saigo privately supported conscription and universal military service, but declined to speak openly about it, possibly because he was beginning to regret the dramatic changes which had been set in motion. Saigō initially disagreed with the modernization of Japan and the opening of commerce with the West. He famously opposed the construction of a railway network, insisting that money should instead be spent on military modernization. He did insist, however, that Japan should go to war with Korea because of the Koreans' repeated refusal to recognize the legitimacy of the Emperor Meiji as head of state of the Empire of Japan. The other leaders of the restoration strongly opposed these plans, arguing that internal development took priority over costly military adventures. Furious, Saigo resigned as Commander of the Imperial Guard and returned to Kagoshima. Several other high-ranking officials and more than one hundred officers of the Imperial Guard also resigned. Saigo Takamori (with tall helmet) inspecting Chōshū troops at the battle of Battle of Toba-Fushimi. Saigo established a private academy in Kagoshima, emphasizing physical training and military science, for the faithful samurai who had also resigned their posts in order to follow him from Tokyo. The school attracted samurai from all over the country, and by 1877, the students numbered about 20,000. The administration of Satsuma was in the hands of Saigo’s supporters, and new appointments were given to graduates from his school. The government in Tokyo became concerned that Kagoshima might become the center of a samurai rebellion, and took some steps which aggravated the tension. On January 29, 1877, while Saigo was away on a hunting trip, a group of his supporters attacked the Kagoshima arsenal. Saigo hastily returned and reluctantly agreed to become their leader. On February 15, Saigo’s army began a march to Tokyo to present their grievances to the government, which had just eliminated their rice stipends. Government forces blocked them at Kumamoto. The Satsuma Rebellion was able to seriously challenge the Imperial army in battle for several months, but by May they were on the defensive and by September their situation was hopeless. Badly injured in the hip during the final battle, the Battle of Shiroyama, Saigō asked for his head to be cut off by a comrade to preserve his honor. According to legend, Saigō committed seppuku, a traditional form of suicide. Only about two hundred of the his original army of 40,000 remained to surrender. Losses on both sides were estimated at 12,000 dead and 20,000 wounded. Saigo’s severed head was hidden by a retainer and never found, so that his death in battle could not be proved and many folktales arose that he was still alive and plotting revenge. Many legends sprung up concerning Saigō, many of which denied his death. Many people in Japan expected him to return from British Raj India or Qing Dynasty China or to sail back with Tsesarevich Alexander III of Russia to overthrow injustice. It was even recorded that his image appeared in a comet near the close of the nineteenth century, an ill omen to his enemies. Unable to overcome the affection that the people had for this hero of tradition, the Meiji Era government recognized his bravery and pardoned him posthumously on February 22, 1889. 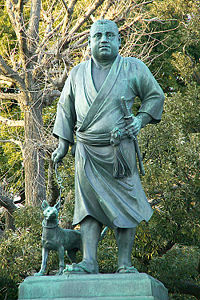 A famous statue of Saigō walking his dog stands in Ueno Park, Tokyo. It was unveiled on December 18, 1898. Saigō met the noted British diplomat Ernest Satow in the 1860s, as recorded in the latter's A Diplomat in Japan, and he was present at the unveiling as recorded in his diary. Saigō's last stand against the Meiji government was the historical basis for the 2003 film, The Last Samurai. Avakian, Monique. The Meiji Restoration and the Rise of Modern Japan. Silver Burdett Pr, 1991. Beasley, William G. The Meiji Restoration. Stanford University Press, 1972. Buck, James Harold. The Satsuma Rebellion of 1877: From Kagoshima through the siege of Kumamoto Castle. S.N., 1973. Mounsey, Augustus H. The Satsuma Rebellion: An Episode of Modern Japanese History. University Publications of America, 1979. Wilson, George M. Patriots and Redeemers in Japan: Motives in the Meiji Restoration. University Of Chicago Press, 1992. Yates, Charles L. Saigo Takamori: The Man Behind the Myth. Kegan Paul, 1995. This page was last modified on 4 April 2008, at 00:46.